Do you know what is your dog trying to say? Knowing how to read your dog's body language is the key to understanding your dog. Because dogs are non-verbal, their body language does the talking for them. Vocalization takes second place to a dog's body language. By interpreting body language, you can assess a dog's attitude and possibly predict the next move. You can determine whether a dog is at ease or uncomfortable with a given situation. After you learn the basic types of dog body language, spend some time observing dogs interacting with people and other animals in various situations. When two animals interact, their body language is almost like a conversation. It may even seem like a kind of dance. Much of the same can be seen between a human and a dog. With some practice, you will begin to see the subtleties of canine body language. Once you understand canine body language, it can do more than simply help you communicate with dogs. Reading a dog's body language can help protect you and your dog from dangerous situations. Without a sound, your dog can tell you that she senses a threat. When watching your dog interact with other dogs, you can watch their body language to see when harmless play may turn into a dog fight. Interpreting body language can also help with dog training and the identification of common behavior problems. 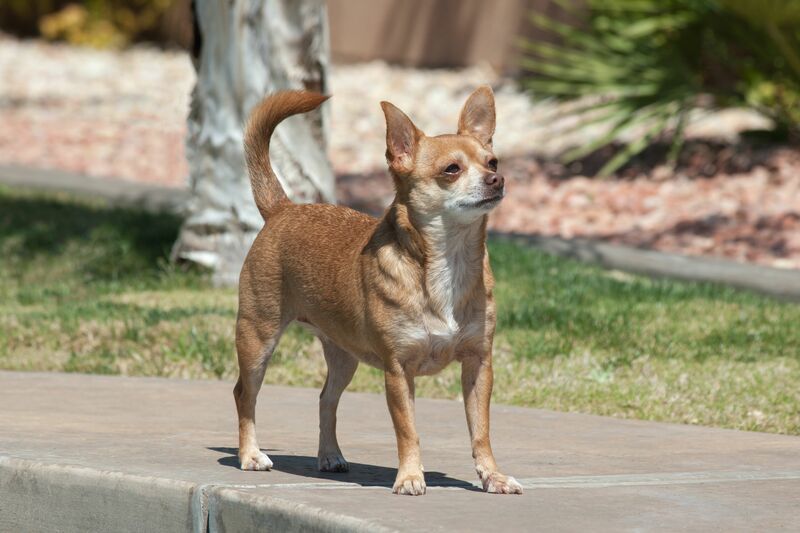 A confident dog stands straight and tall with the head held high, ears perked up, and eyes bright. The mouth may be slightly open but is relaxed. The tail may sway gently, curl loosely or hang in a relaxed position. The dog is friendly, non-threatening, and at ease with her surroundings. 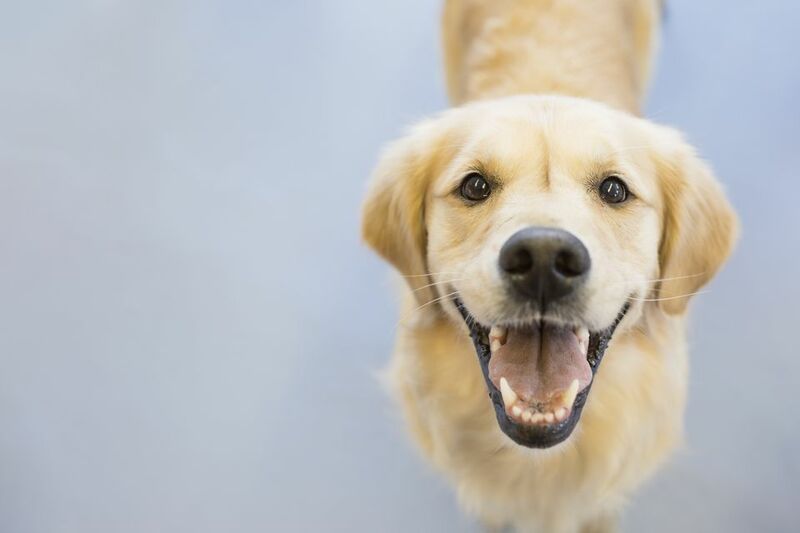 A happy dog will typically show the same signs as a confident dog. In addition, the tail may wag and the dog may lightly pant. The happy dog appears even more friendly and content than the confident dog, with no signs of anxiety. A playful dog is happy and joyful. The ears are up, the eyes are bright, and the tail usually wags rapidly. The dog may jump and run around with glee. Often, a playful dog will exhibit the play bow: front legs stretched forward, head straight ahead, rear end up in the air and possibly wiggling. This is most certainly an invitation to play! An excited dog will exhibit the body language of both a happy and playful dog. The dog will typically jump and run around, pant, and even whine. The eyes are wide and the tongue may hang out. Some dogs will get so excited that they become hyperactive; they may jump on people, bark loudly or get the zoomies. Excitement is not always a good thing; extremely excited dogs may become exhausted or overstimulated. This can lead to stress and anxiety. Try to calm an excited dog by redirecting to a training command, chew toy, or exercise (like running outdoors). Avoid physical restraint or pulling the leash as this can lead to overstimulation. An anxious dog often has a lowered head, holds the ears partially back, and the stretches the neck out. The dog may also appear to have a furrowed brow. An anxious dog typically stands in a tense posture with a tucked tail. It is common to see yawning, licking of the lips, or showing the white of the eyes (whale eye). An anxious dog may overreact to stimulus and can become fearful or even aggressive. If you are familiar with the dog, you may try to divert attention to something more pleasant. However, you must be cautious. Do not provoke or try to soothe the dog. A fearful dog exhibits signs similar to an anxious dog, but with more extreme signals. The dog stands tense and low to the ground with the ears flat back and the eyes are narrowed and averted. The tail is usually tucked between the legs, and the body often trembles. The dog may even urinate or defecate. A fearful dog often whines or growls and might even bare teeth in self-defense. This dog may turn aggressive quickly if threatened. Do not try to reassure the anxious dog, but remove yourself from the situation calmly. If you are the owner, be confident and strong, but do not comfort or punish your dog. Try to move the dog to a less threatening, more familiar location. An aggressive dog usually starts out as anxious or fearful. If the anxiety and fear continue, the dog may begin to show signs of aggression. An aggressive dog will plant all feet are firmly on the ground in a territorial manner and may lunge forward. The ears are pinned back, the head is straight ahead, and the eyes are narrowed but piercing. The tail is usually straight, held up high, and may even be wagging. The dog may bare teeth, snap the jaw, and growl or bark threateningly. The hairs on the back may stand on edge. If you are near a dog showing these signs, it is very important to get away carefully. Do not run. Do not make eye contact with the dog. Do not show fear. Slowly back away to safety. If your own dog becomes aggressive, seek the assistance of a professional dog trainer to learn the proper way to correct the behavior. Note: dogs with aggressive behavior should never be used for breeding. The concepts of submission and dominance in dogs are misunderstood by many people. In the photo shown here, the dogs are playing. The dog on the right is assuming a submissive position (lying belly up) while the one on the left appears to be "dominant" by standing over the other. It's important to understand that dominance is not a behavior, but a dynamic in a relationship between two dogs. Dogs in groups do not typically establish rigid hierarchies the way other animals do, but there is sometimes a "pecking order." This dynamic tends to develop naturally in groups of dogs. Body language that appears "dominant" is generally just confidence. If one dog assumes a submissive position, the other may stand over the submissive dog in a confident posture, as if he is proud to be "winning." While two dogs are playing, they will often repeatedly reverse roles, each taking turns displaying dominant and submissive stances. A dog showing submissive behavior is sending a message that he is not a threat. He puts himself in a position that tells others he means no harm. Submissive behavior is a choice, not something a dog is forced into. This behavior may be exhibited around people, dogs, or other animals. A dog displaying submissive behavior may hold his head down and avert his eyes. His tail is usually low or in a neutral position, but not tucked. He may roll on his back and expose his abdomen. The dog may also nuzzle or lick the other dog or person to further display passive intent. Sometimes, he will sniff the ground or otherwise divert his attention to show that he does not want to cause any trouble. A dog displaying submissive behavior will generally act meek, gentle, and non-threatening. A dog in a submissive posture is not necessarily anxious or fearful. The dog may be showing submissive behavior as a part of play. It's important to assess the overall situation, then look closely at the dog's facial expression and body language to better understand what is going on. Could Your Dog Have Social Anxiety? When is It OK to Let Your Dog Off the Leash?